Well, as it turns out I didn’t need any luck and let me tell you some of the many reasons why. 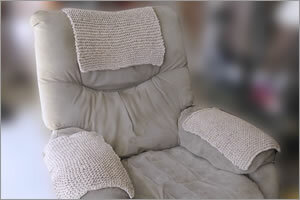 First, my avid knitter wife loved the idea of making armrest and headrest covers for my La-Z-Boy armchair. It was as if we had never discussed replacing that old chair. So that was a welcomed relief. Next, rather than revisiting the discussion about whether we should beautify or replace the chair, we jumped right into a discussion about what thickness of yarn would be the most suitable for making armchair covers. It took no time at all for my wife to suggest a yarn that would be perfect for the look and feel we had in mind. Then we considered colors. Since the color of the chair is light taupe, I suggested that maroon or dark brown covers would make for a nice accent to the chair and offer a contrasting stylish look, or so I thought. My wife helped me with my thinking and told me that a yarn in the same color as the chair would look much better and less garish. A few moments later, she handed me a yarn, Shoelace 4 Light Taupe, that was virtually identical in color to my chair. I have to admit, she was right. It really looked good. Now this Shoelace yarn, it was thick and just like a shoelace from an old-style tennis shoe. And wow, was it easy and fun to knit with! The thickness and texture of the Shoelace yarn made it much easier to grip and release and very easy for me to control the yarn tension. Not once did my work become too loose or too tight. 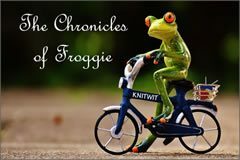 My work never fell off my needles, I didn’t drop a single stitch, and I never had any difficulties with inserting my right-hand needle through the stitch loops on my left-hand needle. Better yet, I could really see and understand what was going on with my knitting, the motion of winding the yarn around the needle, drawing it back through the stitch, slipping the original stitch off the left-hand needle, and the resulting shape of the stitches and work. Quite frankly, I think that this Shoelace yarn, or just a thicker yarn in general, would have been a much easier yarn for me to initially learn on rather than the thin acrylic yarn that was so hard for me to handle. Anyway, I really liked the way this project turned out. 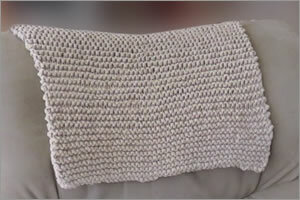 The knitting looked great and had a very functional, heavy-duty feel to it and was surprisingly very soft to the touch. In addition to beautifying my chair which was my original intent, I could see that these armrest and headrest covers would protect my arm chair from normal wear and tear, spills, and dirt and, well, me. A beautiful La-Z-Boy chair, an end to that talk of replacement. One stone, two dead birds. That’s what I’m talking about!